Saint Patrick's day is pure craziness in Chicago. 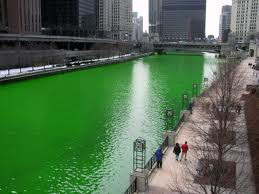 The Chicago River is dyed green and there are parties everywhere. It is a day when no matter what family heritage people have - they suddenly become Irish. Alan and I looked up the reasons for St. Patrick's Day and found it very interesting. I think we are all familiar with the story of St. Patrick driving the snakes out of Ireland - but I wondered how that somehow turned into a day of debauchery! As we continued to read, there was an account of St. Patrick going into a pub - ordering a drink, only to have the bartender short him on the amount of liqour in the glass. (Say it was to be a 4 oz. whiskey and he was only given 3 oz.) He told the bartender that there was a demon in the basement that fed on the extra alcohol that the bartender was skimping on and that the only way to rid himself of the demon was to starve him with generosity. As the story goes, the bartender began to be generous to all of his patrons and the demon left his basement. Now that is an interesting story. I still don't think it lends itself to drinking from dawn until dusk - passing out on the street, stumbling around, yelling and depositing green vomit on all of the streets - but I do love this story of generosity. It got me thinking about who I am feeding in my life? Am I feeding my selfishness or my generosity? Am I feeding myself with the fare of this world or with God's Word? Am I feeding my desire to please the Lord or my desire to please myself? Am I feeding my tendency to judge or my desire to dispense grace? What if our St. Patrick's day tradition became one of being intentional about our generosity to all for that weekend? What if we were truly intentional about being generous all the time? Don't get me wrong . . . I'm not judging anyone or looking down on someone who wants to have a green beer on St. Patty's Day or even those who overindulge. I do, however, feel a deep sadness when we try to fill our lives with things that we think will bring us satisfaction and neglect to turn to the One who can truly give us what we want and need. The emptiness of that breaks my heart. Let's be a people who are generous with our love . . . with grace . . . with the gospel . . . with kindness . . . with forgiveness . . . with our time . . . with our lives.